As one of the most popular sightseeing spots, Asakusa offers a taste of historic and religious Japan. A number of festivals are held here throughout the year. The surrounding area also offers a unique feel of an older Tokyo that you do not find elsewhere in the city, so it is worth exploring. 03-3841-2871 | Central Exit of Tobu Asakusa Sta. Sensoji Temple is also known as Asakusa Kannon and has a history of over 1,300 years. People come by everyday because they believe that, by waving smoke of the burning incense toward the problematic areas of their body, they will be cured of pain and disease. 5 min. from Asakusa Sta. 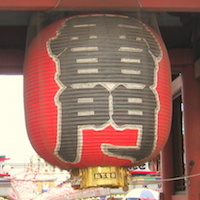 With the God of Thunder on the left, the God of Wind on the right, and a huge red lantern in the center, Kaminari-Mon (Thunder Gate) is the symbol of Asakusa. Nakamise is a 200m long shopping street with souvenirs and traditional Tokyo confectioneries that stretches from the Gate to the Temple. 2 min. from Asakusa Sta.